Separate the dough into 4 equal parts (muffin pan) or 6 equal parts (cupcake pan). Push the dough into the molds; try to make the dough cover the sides. 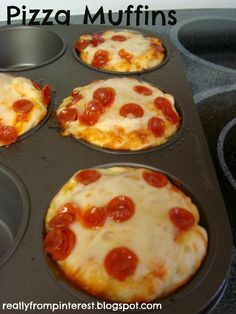 Remove from oven and cover dough with pizza sauce, cheese and pepperoni.